The Cleveland Browns and P Britton Colquitt have agreed to terms on a four-year deal. 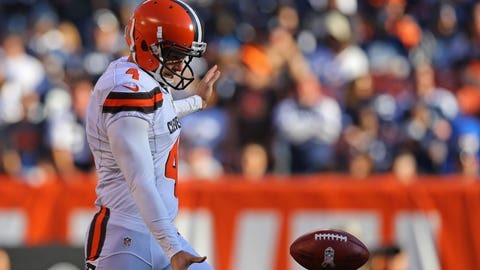 Colquitt set a Browns single-season record with a net average of 40.31 in 2016. He also landed 22 punts inside the 20-yard line and had just two touchbacks on 83 punts. Colquitt is 6-2, 205 pounds and entering in his eighth NFL season out of Tennessee. Originally signed as an undrafted free agent by Miami in 2009, Colquitt handled punting duties for Denver in every contest from 2010-15. He helped the Broncos win Super Bowl 50 and joined the Browns prior to the start of 2016. In 112 career regular season games, he has a punting average of 45.2 and net average of 39.3. His brother, Dustin, is the punter for Kansas City.